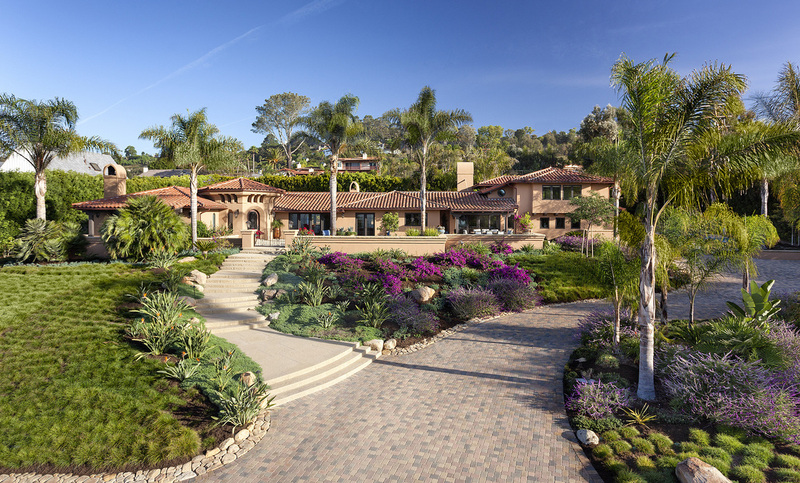 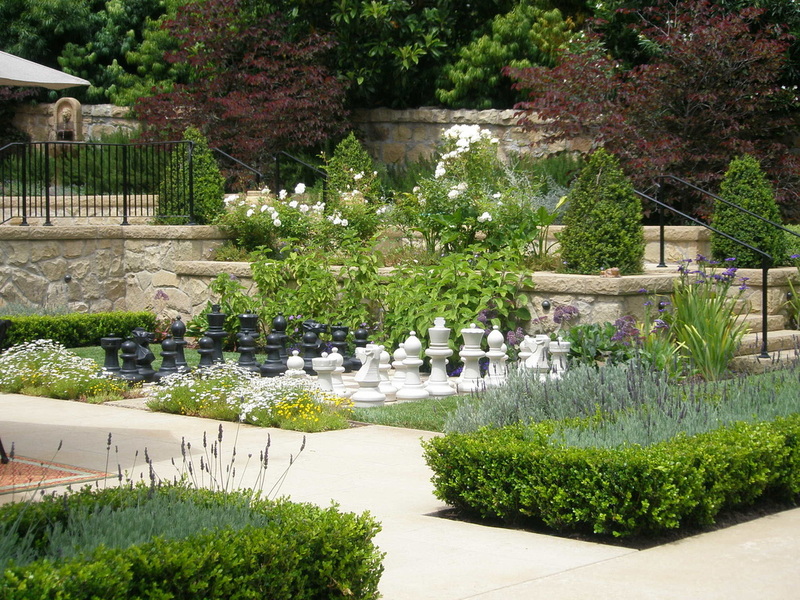 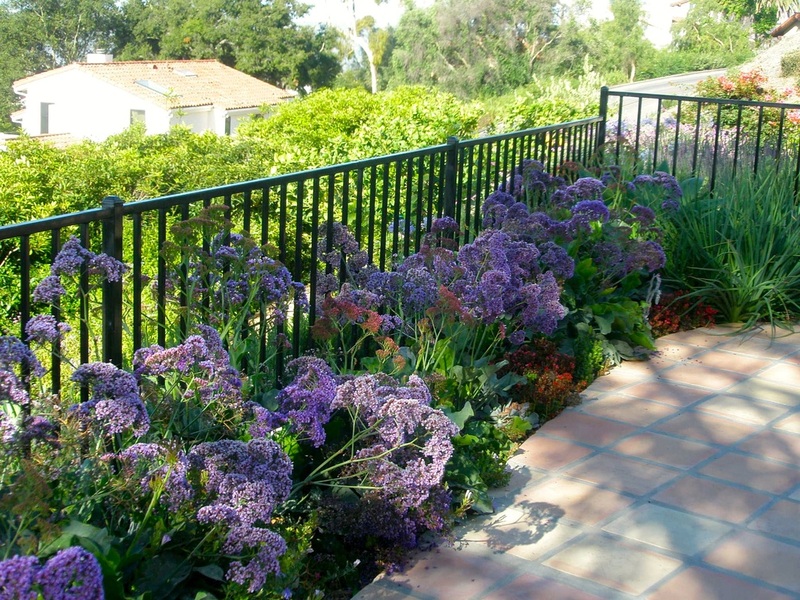 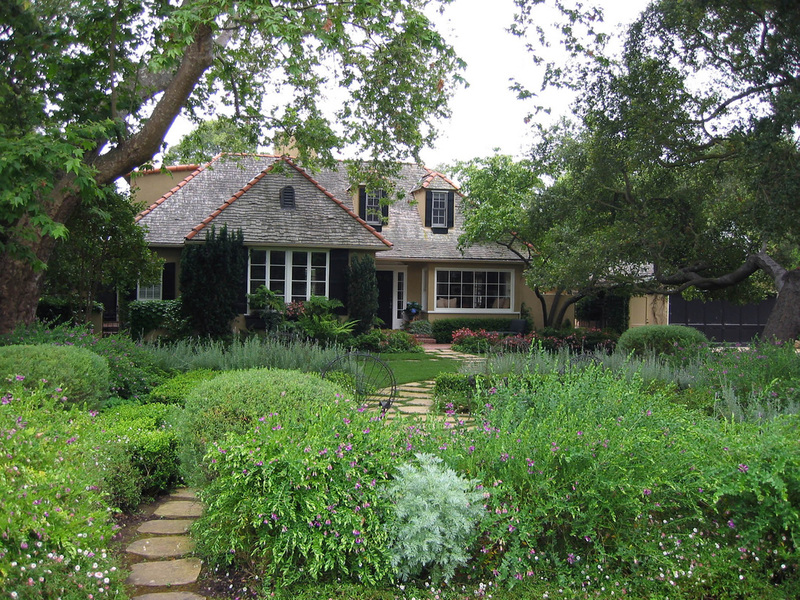 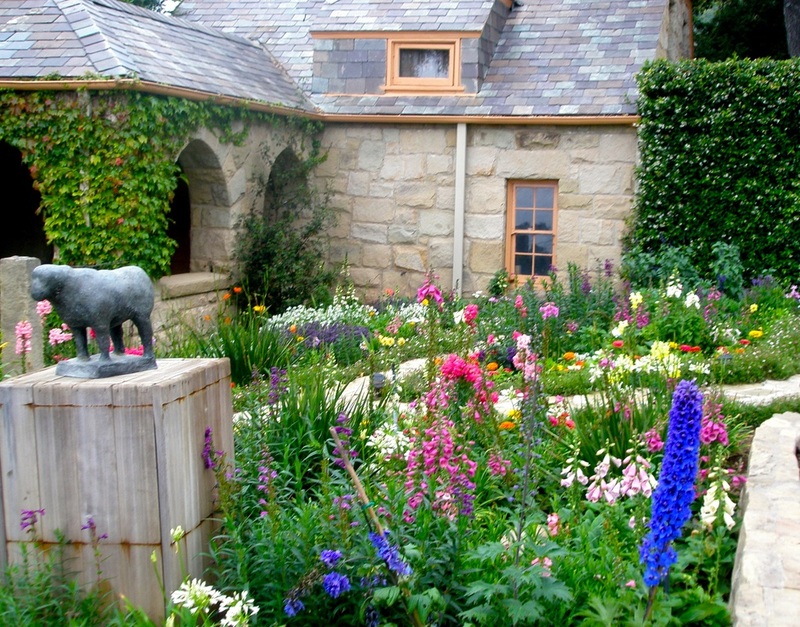 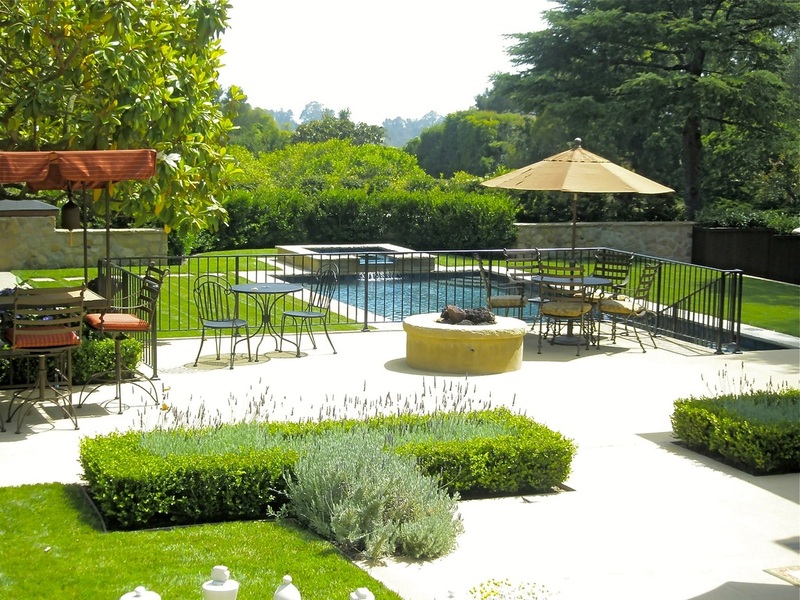 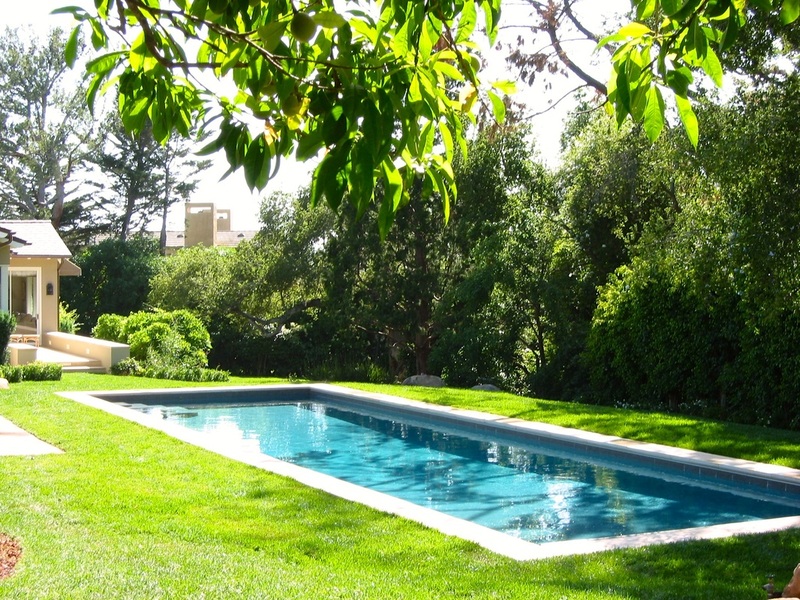 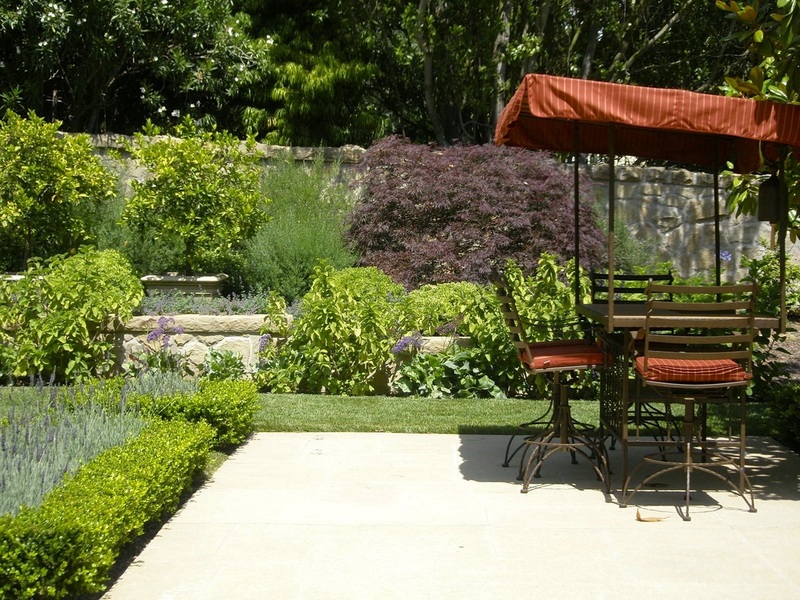 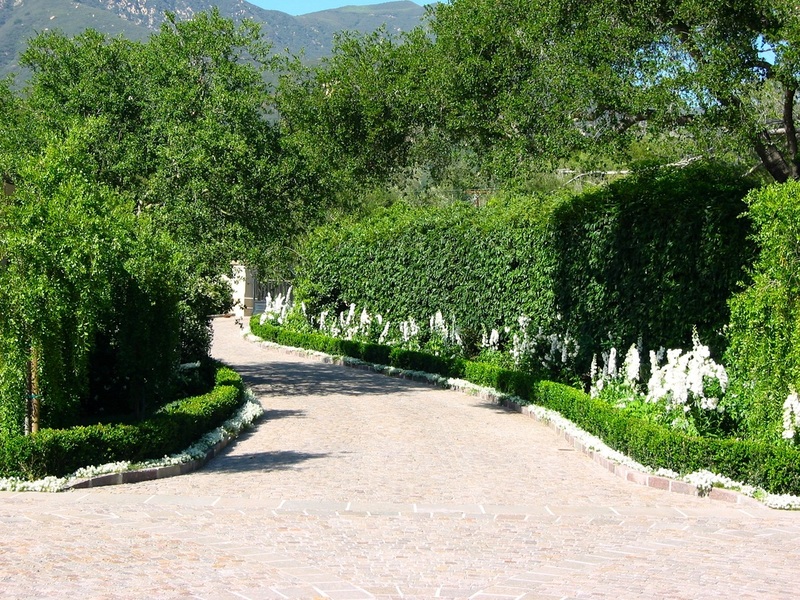 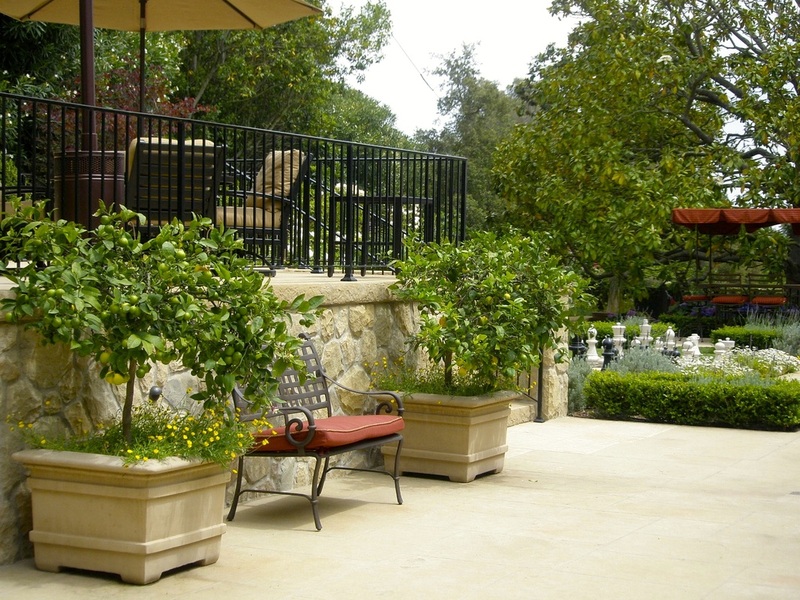 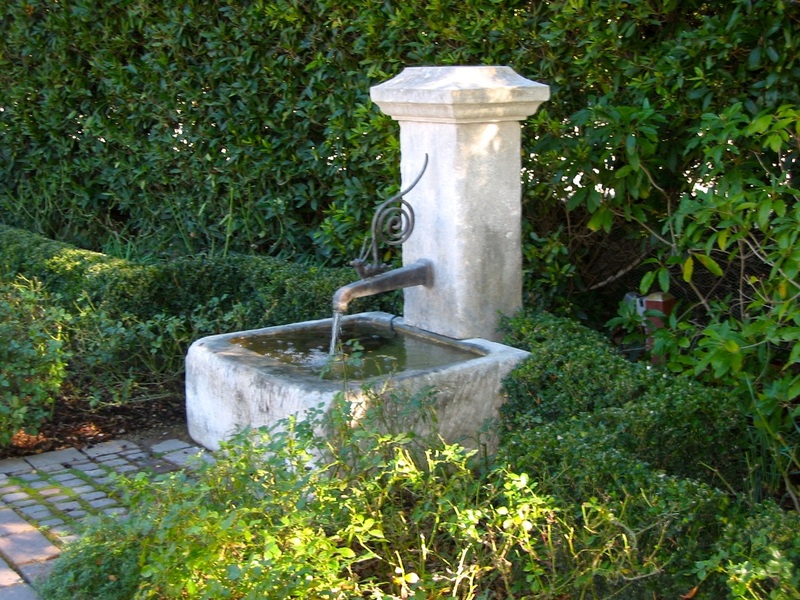 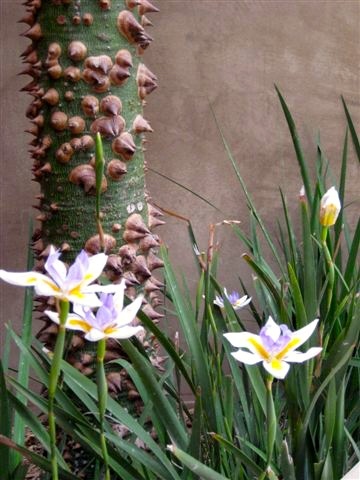 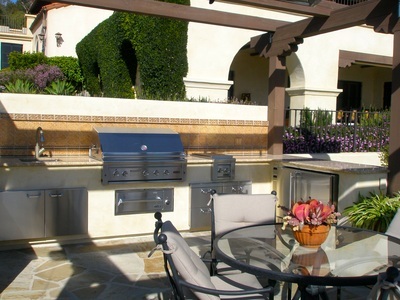 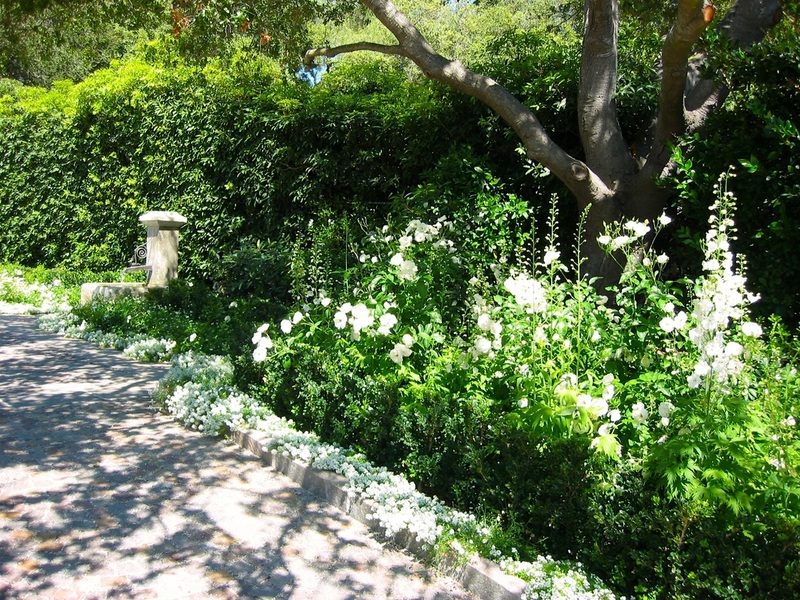 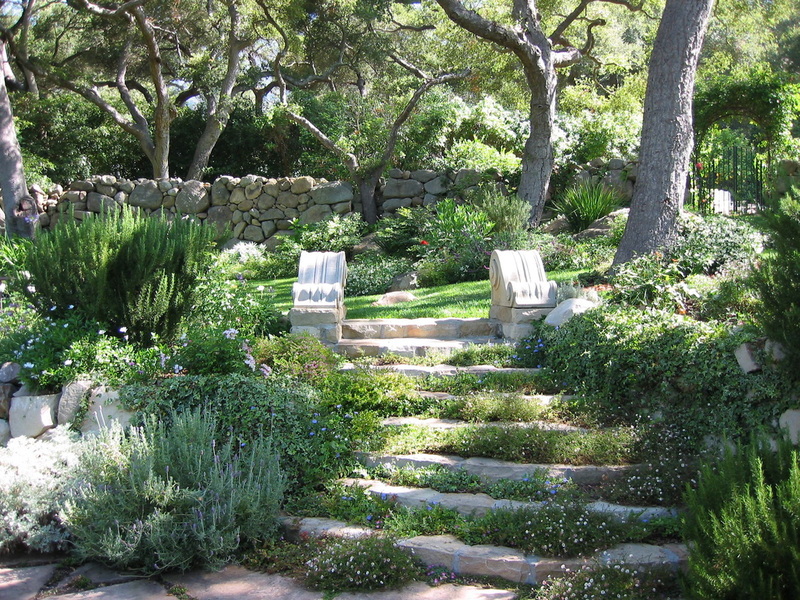 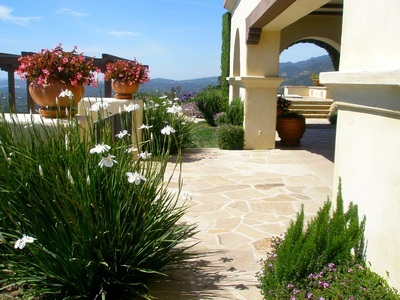 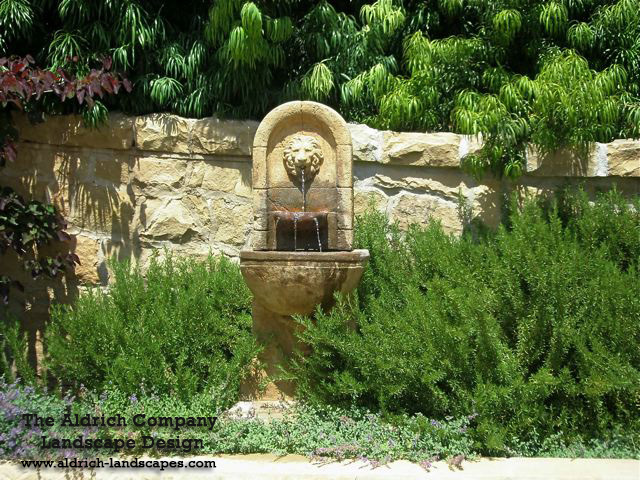 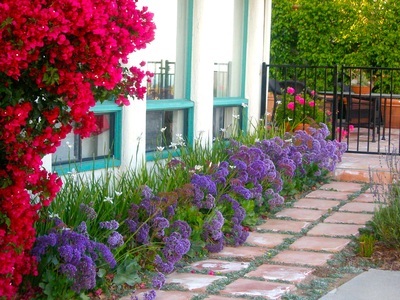 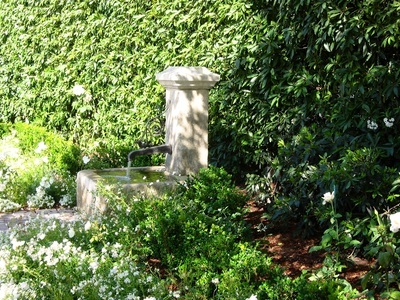 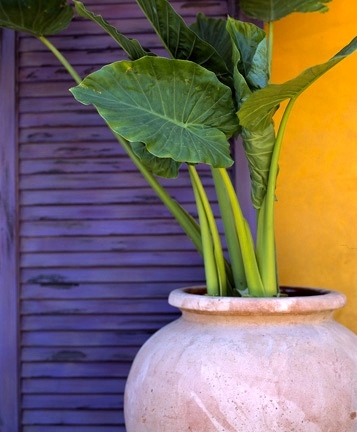 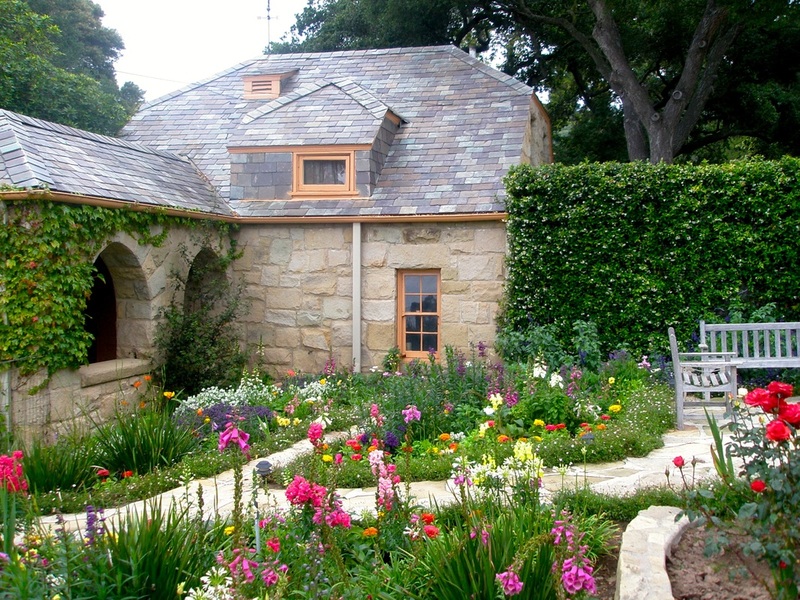 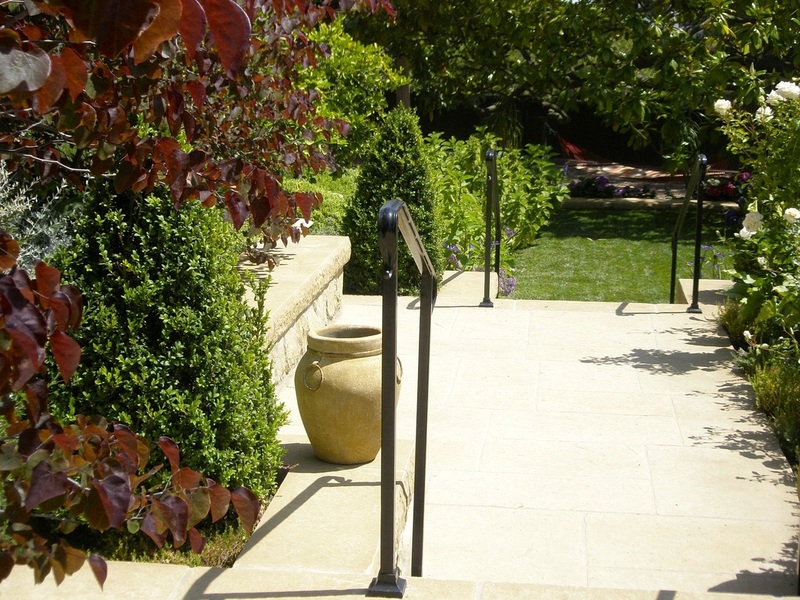 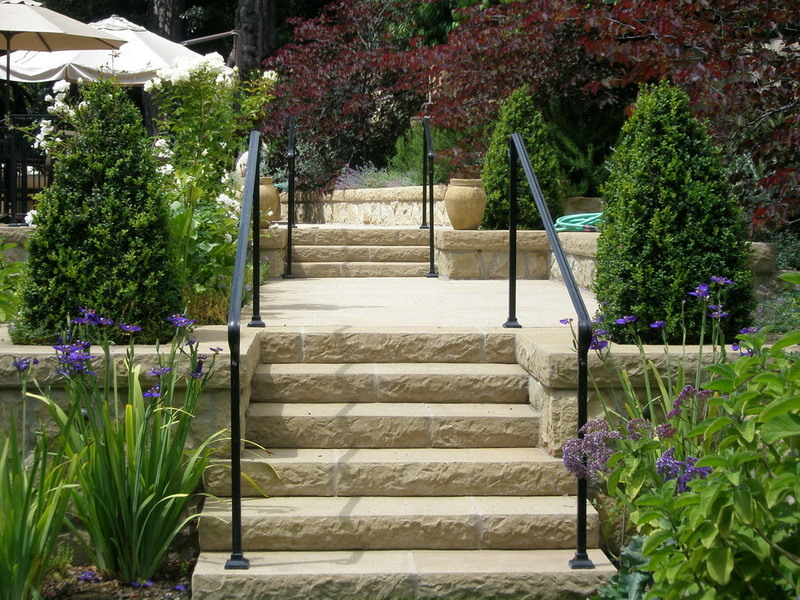 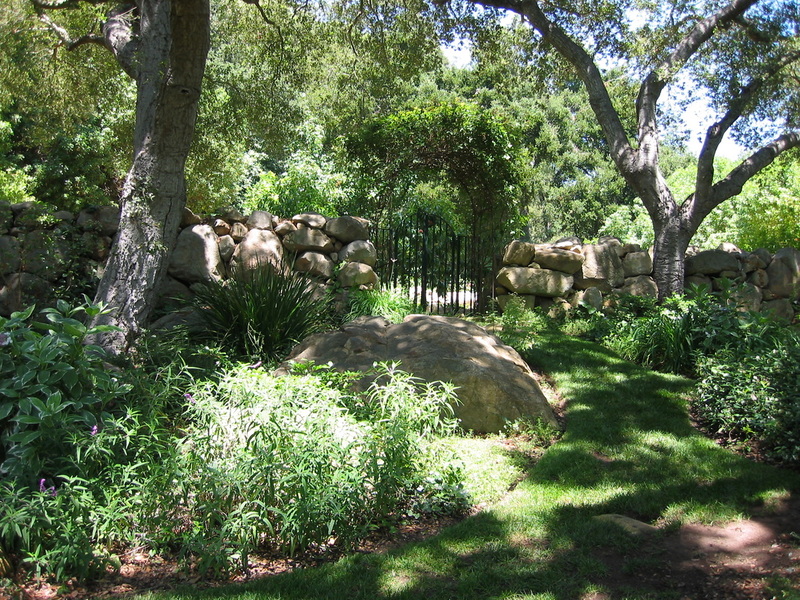 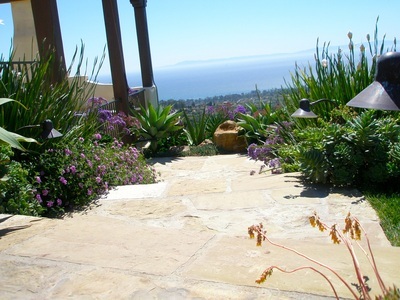 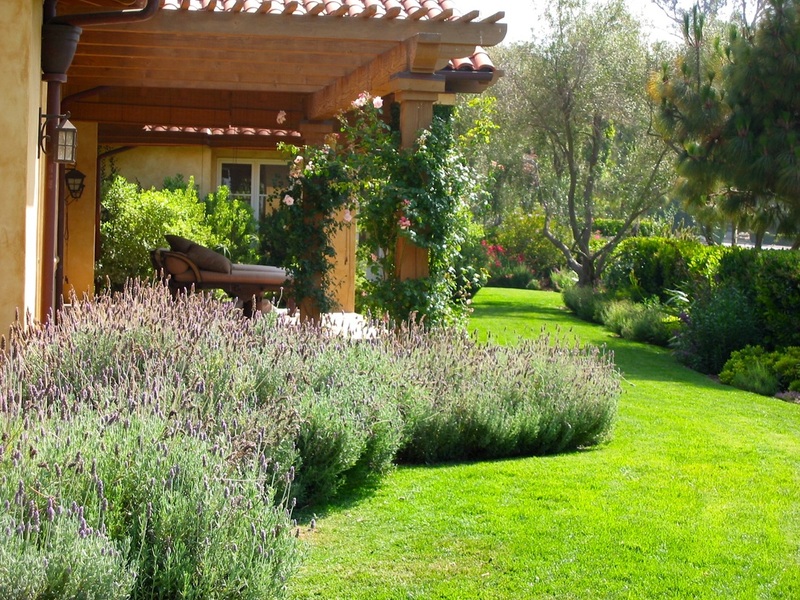 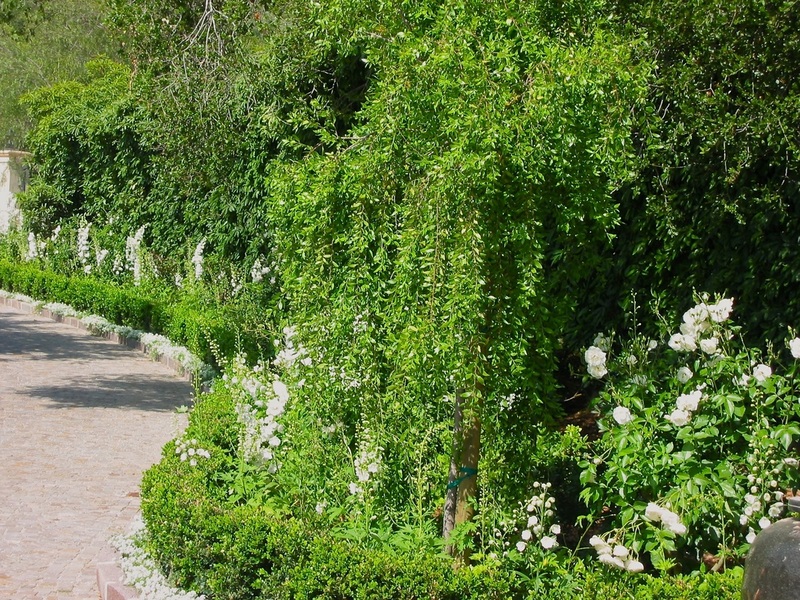 The Aldrich Company is the #1 luxury landscape design firm in Montecito, Hope Ranch and Santa Barbara. 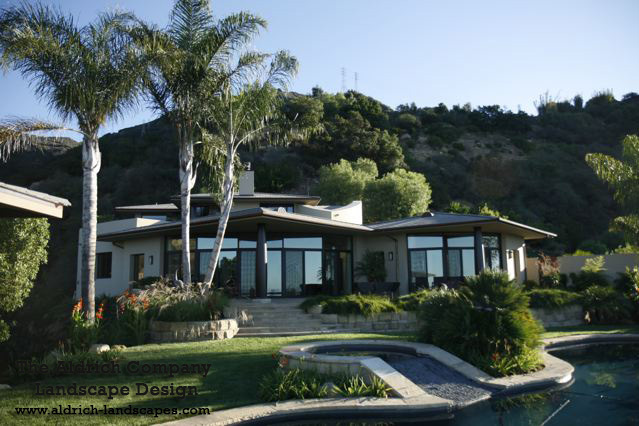 Welcome to The Aldrich Company, where we show you our past and present projects for your viewing pleasure. 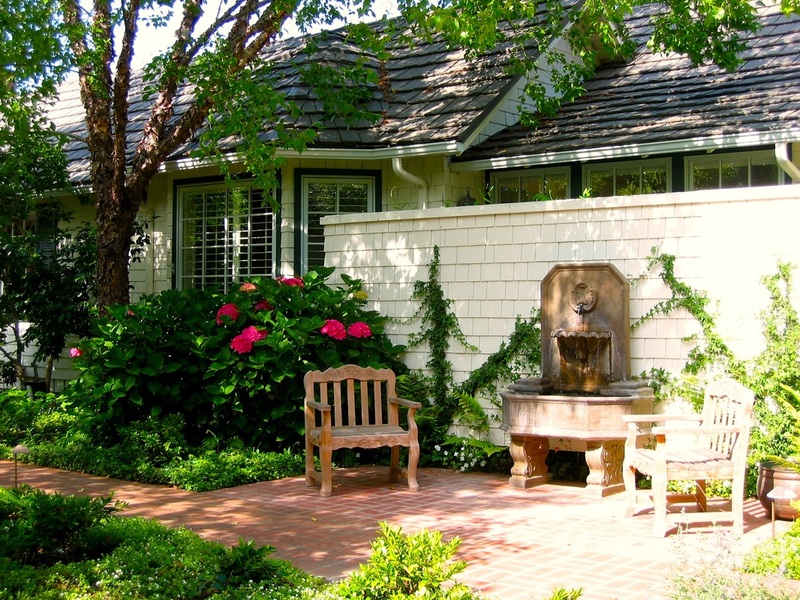 The Aldrich Company is proud of each and every design, from tropical bungalows, to traditional estates, and to seaside cottages. 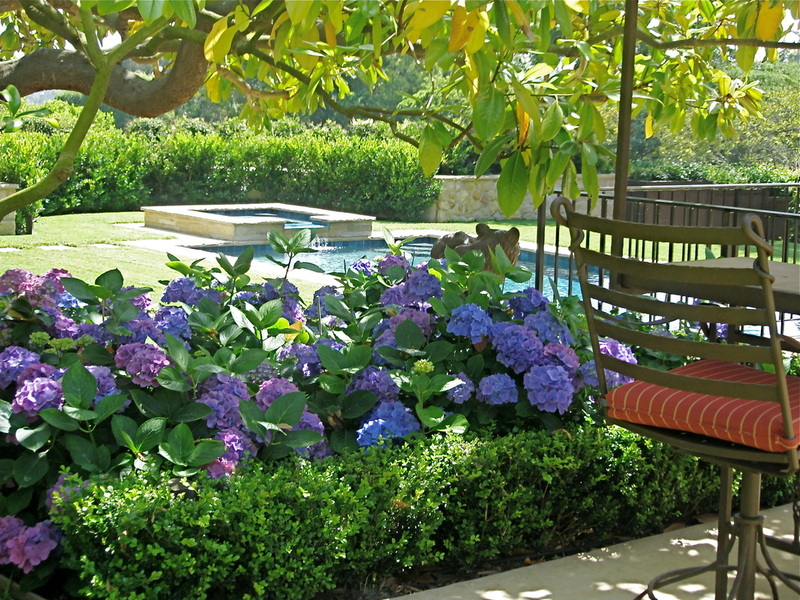 Take a moment to browse through at your leisure. 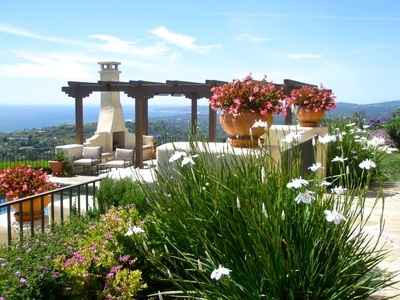 This landscaping, high in the hills above Santa Barbara (with breathtaking city and ocean views) was designed by Alida Aldrich to compliment a newly constructed home of Contemporary/Balinese architecture. 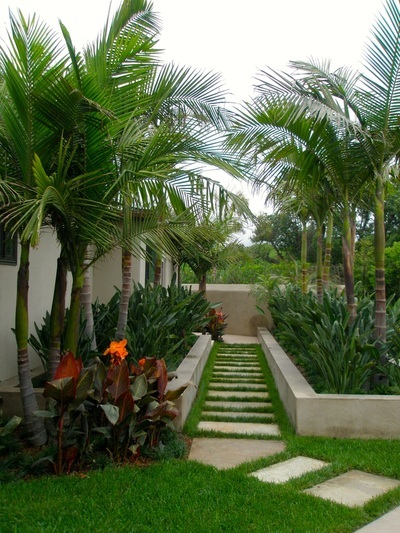 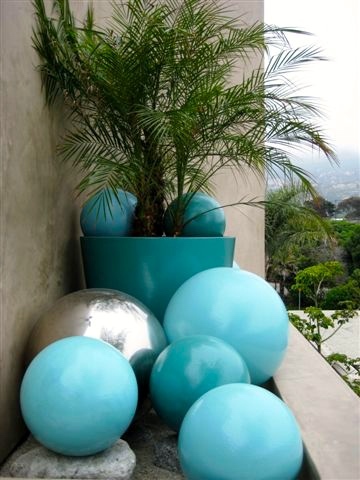 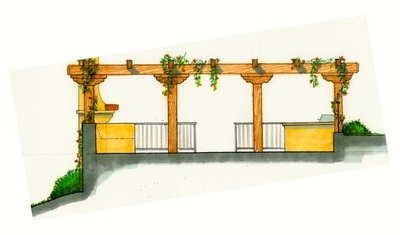 The client asked for a tropical garden. 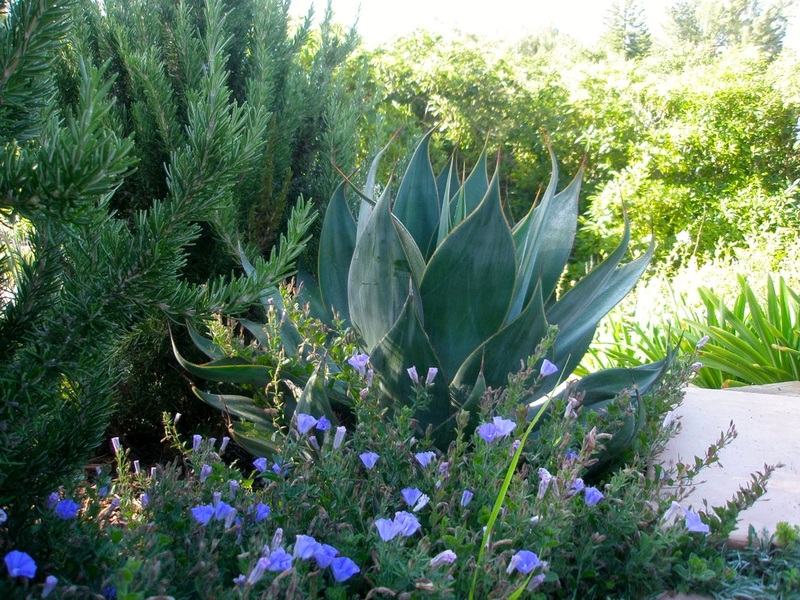 Given high summer temperatures, and local sundowner winds, this planting palette was quiet a challenge, but turned out to be a smashing success. 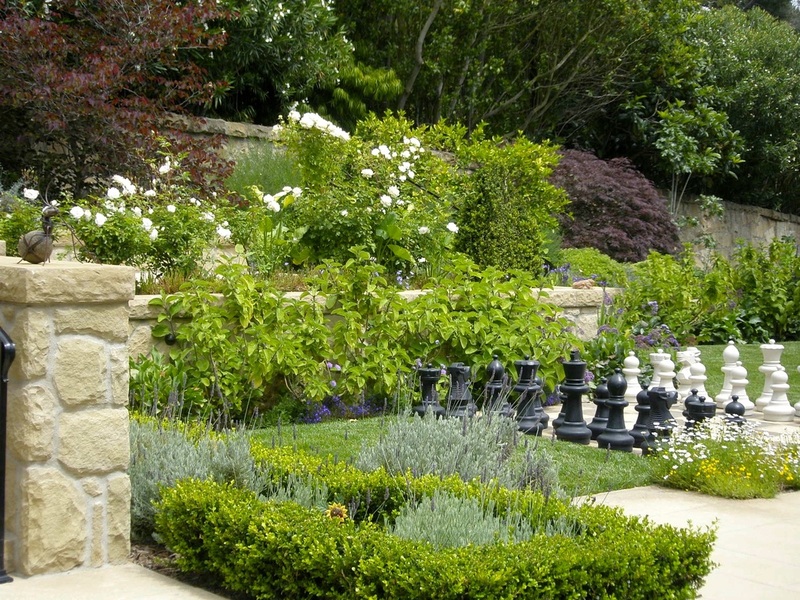 Alida constructed a ten-foot high sandstone retaining wall (with a slight terracing effect for architectural interest) along the entire length of driveway. As a welcoming element, the motor court now has a custom laid, stone labyrinth. From the flagstone patio off the house to lounging in the Bali (adjacent to the magnificent infinity pool) the rear garden offers hours of entertaining possibilities. 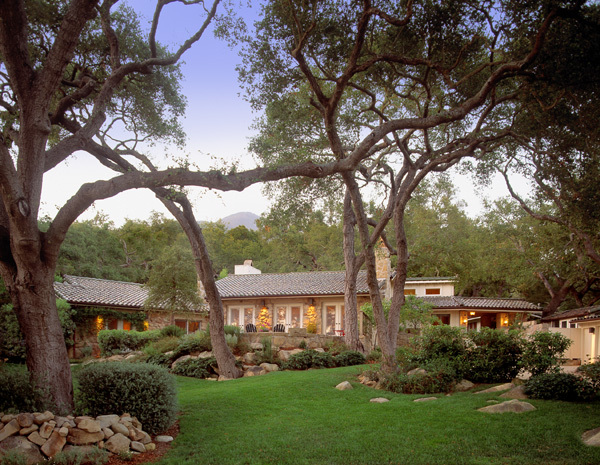 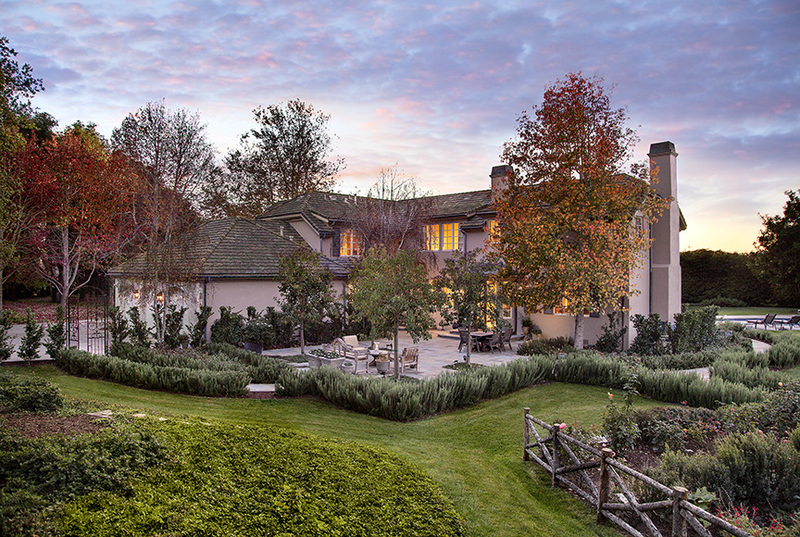 Both of these residences are on the former famed McCormick Estate in Montecito. 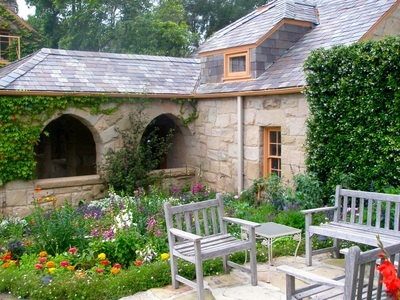 The house on Rivenrock was once the theatre on the estate, the Rockbridge house was the Stone Mason Work Shop. 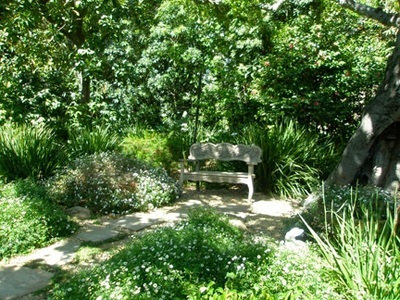 Wonderful old Oak trees abound in both gardens! 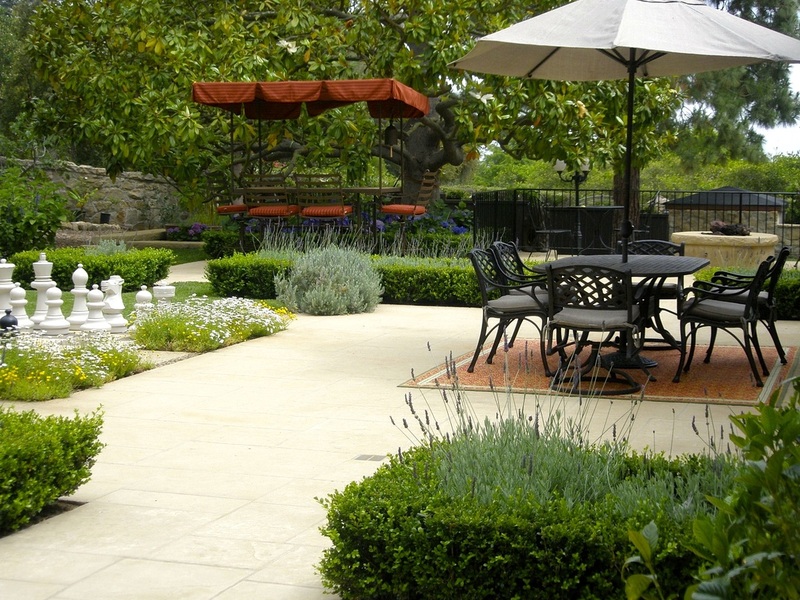 The client on Rivenrock does a great deal of entertaining, so our task was to supply open spaces for dining and games. 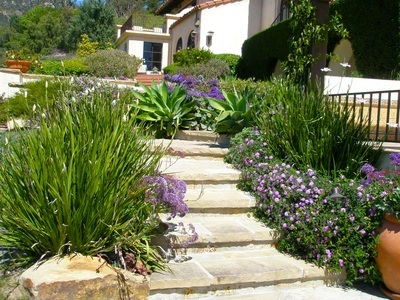 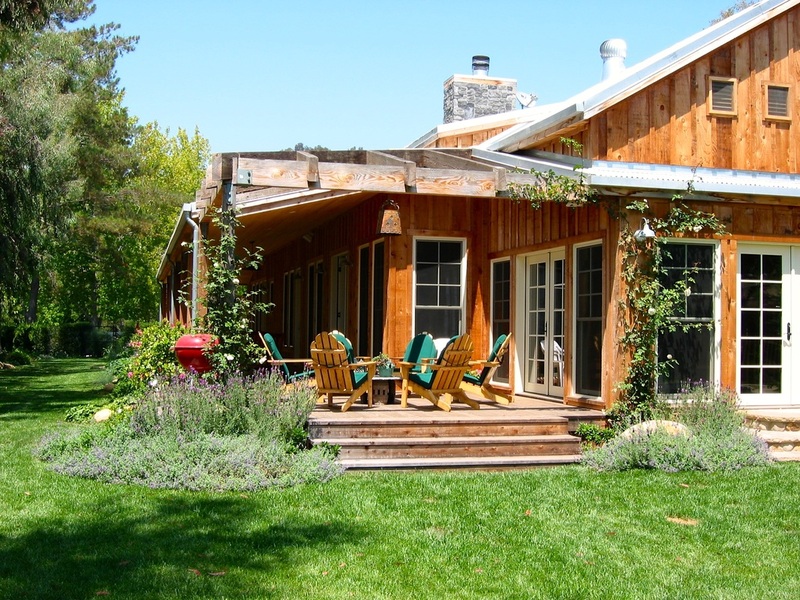 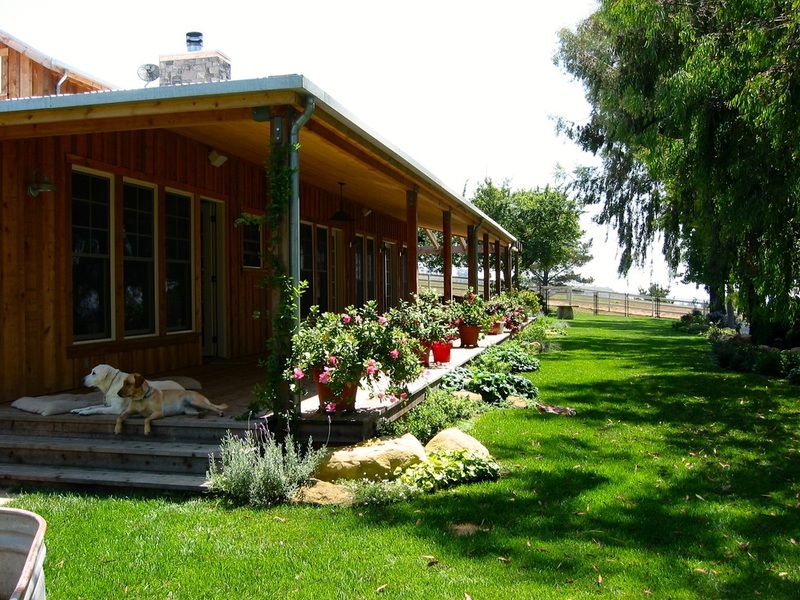 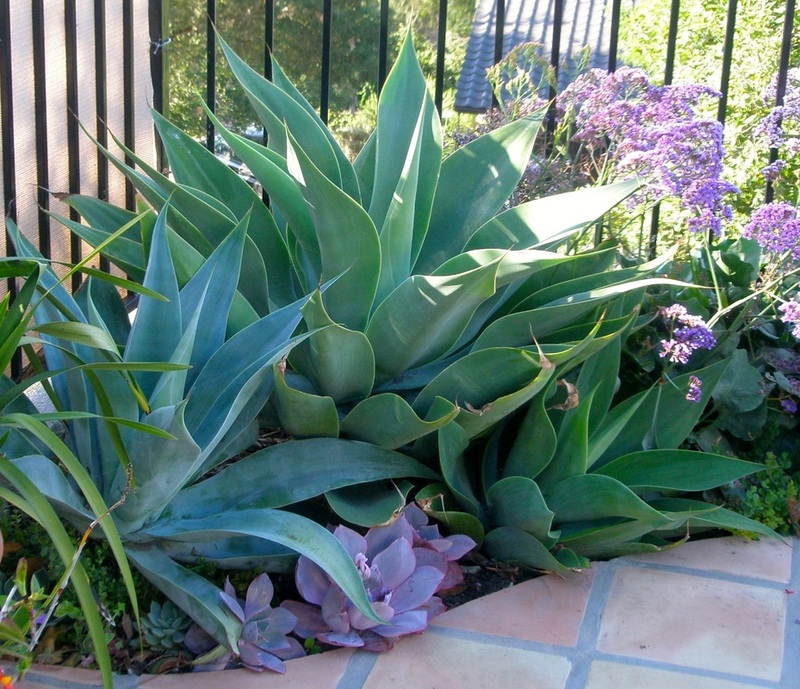 When we began the Rockbridge design, the property was overgrown with ivy and Agaves. A big plus is a marvelous stream running adjacent to the gardens. 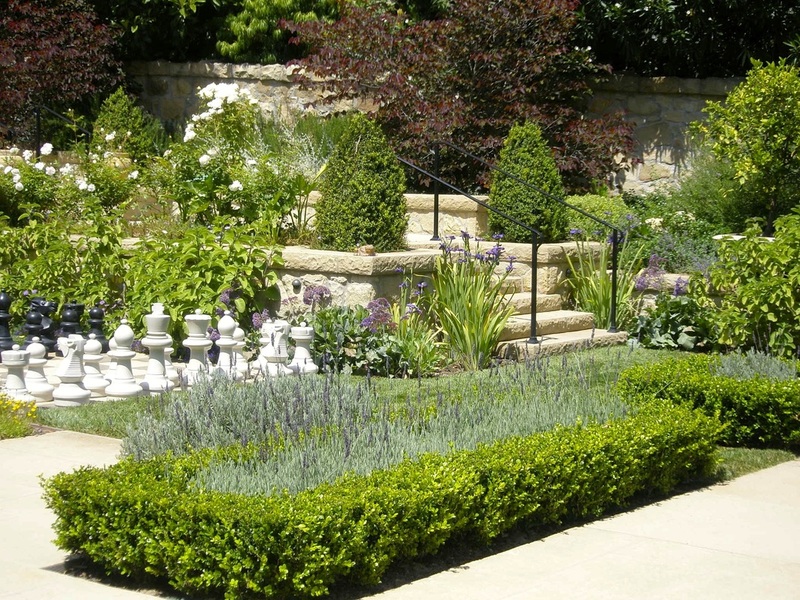 The owner at Rockbridge wanted a secluded garden with ‘rooms’ at the various terraced levels. 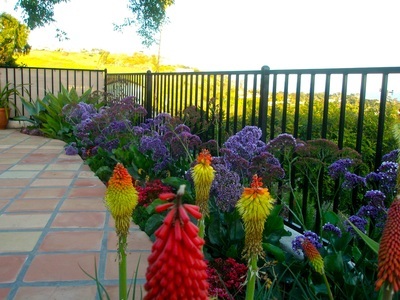 Both clients asked for a traditional garden palette with a good deal of color throughout the year. 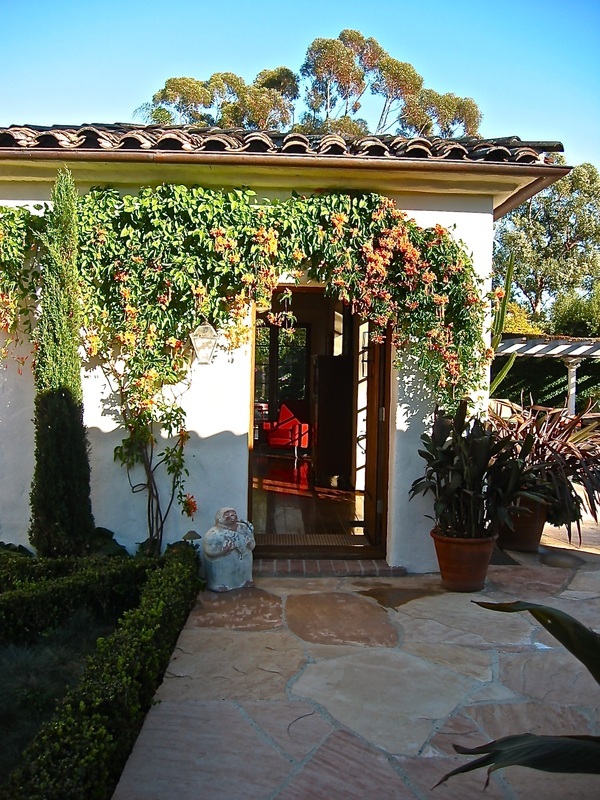 The Aldrich Company has had the honor of working on homes designed by the famous architect, George Washington Smith, but in this case, it was his actual home in Montecito, dating to 1924! 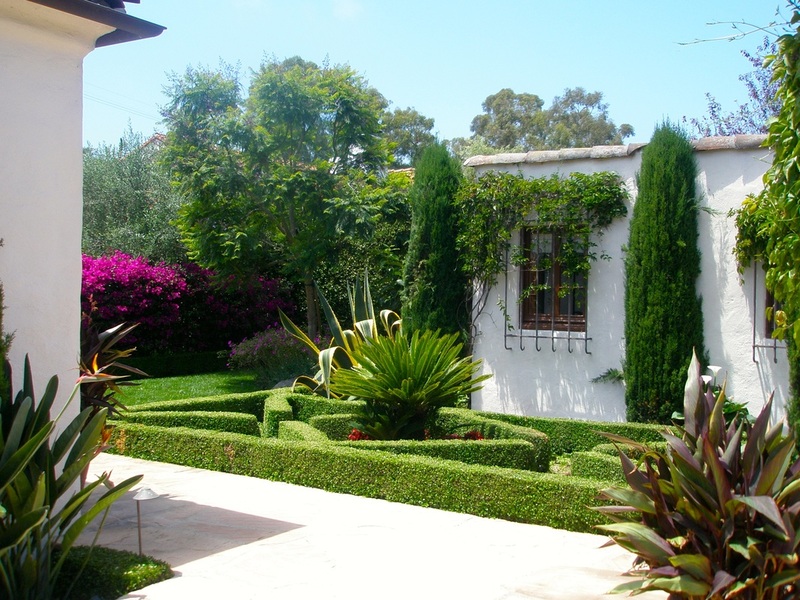 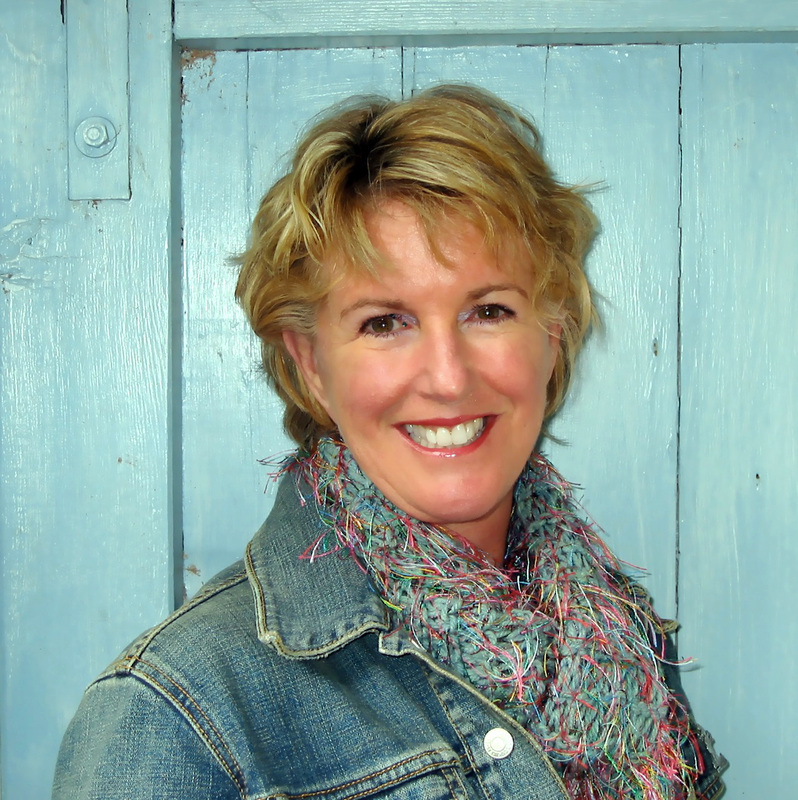 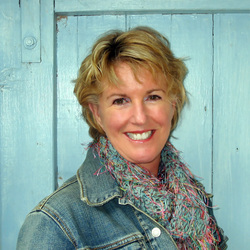 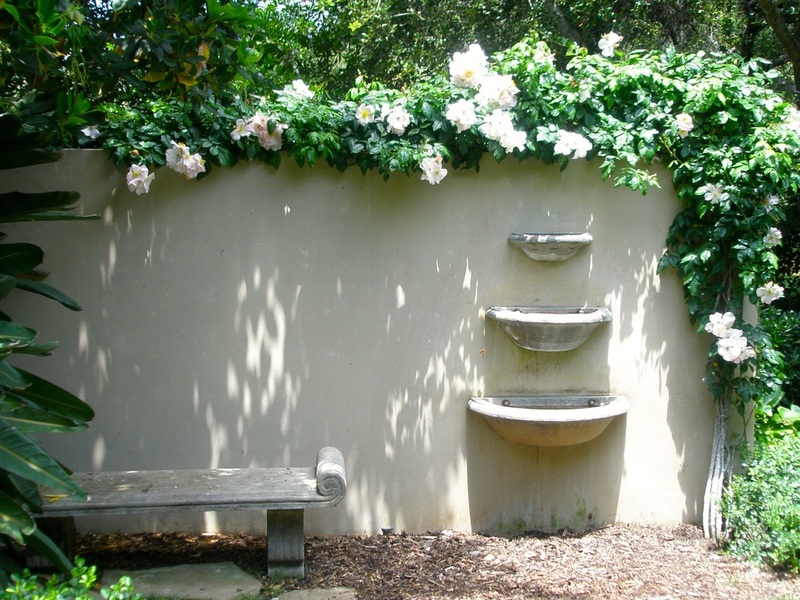 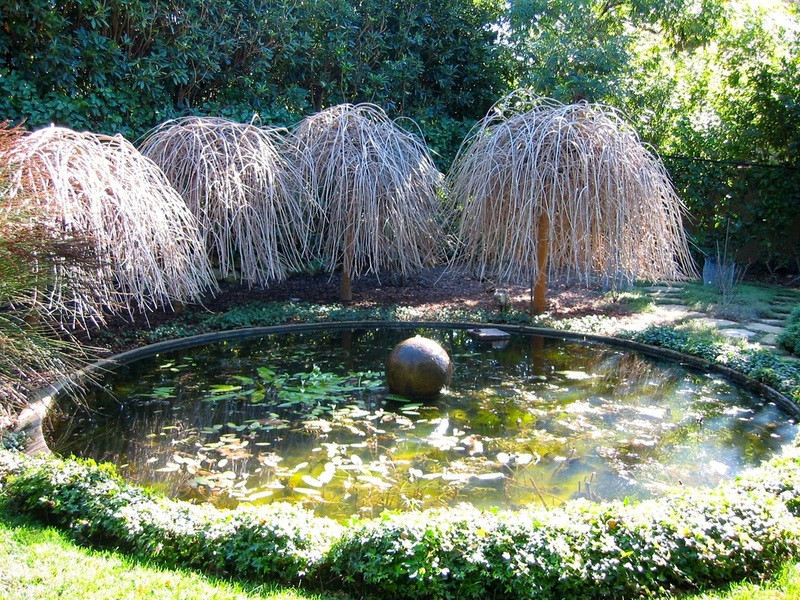 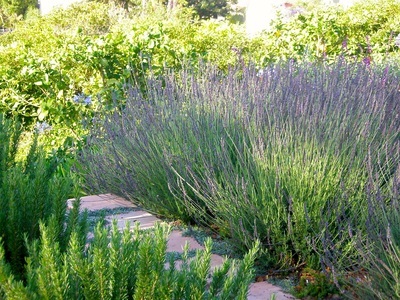 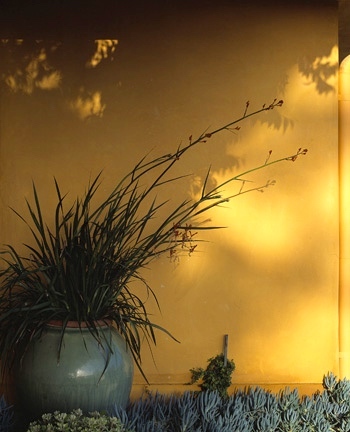 The Company's principle designer, Alida Aldrich studied old architectural and landscape plans at UCSB in order to design gardens that would pay homage to the original design, but with an updated flair. 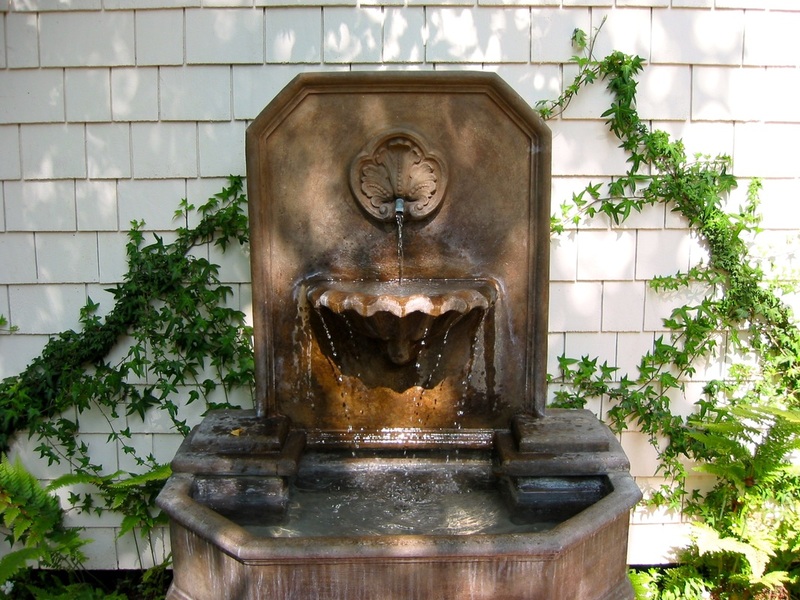 Having a main house, two guest houses and an interior courtyard offered opportunities to incorporate period design elements of wrought iron, flagstone, gravel and three new fountains. 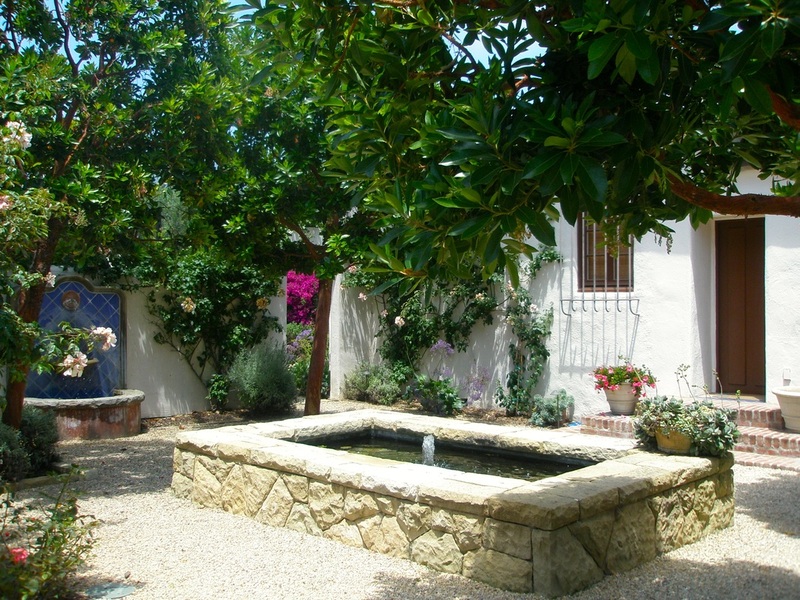 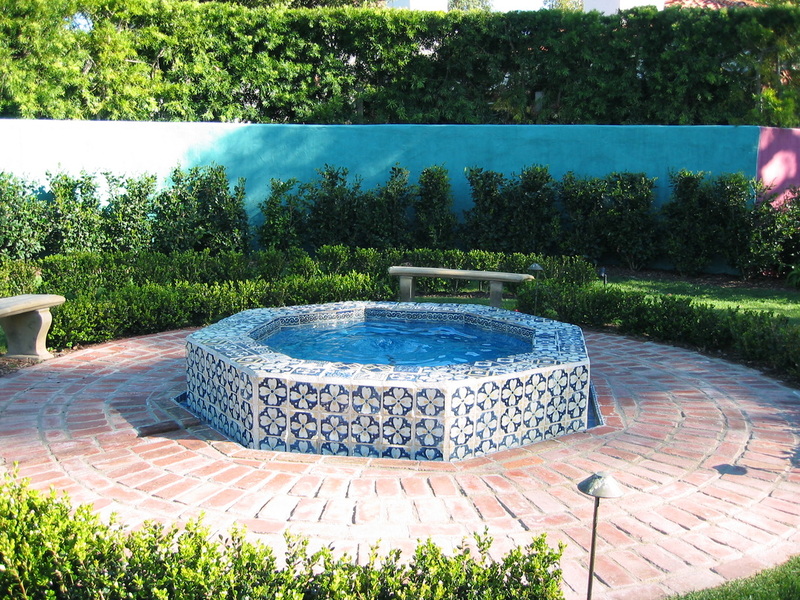 We added the pool in the rear garden, and put in a koi pond with a seating wall in the interior courtyard. We brought in mature Olive, Pepper and Arbutus Marina trees to accent the original architectural design. 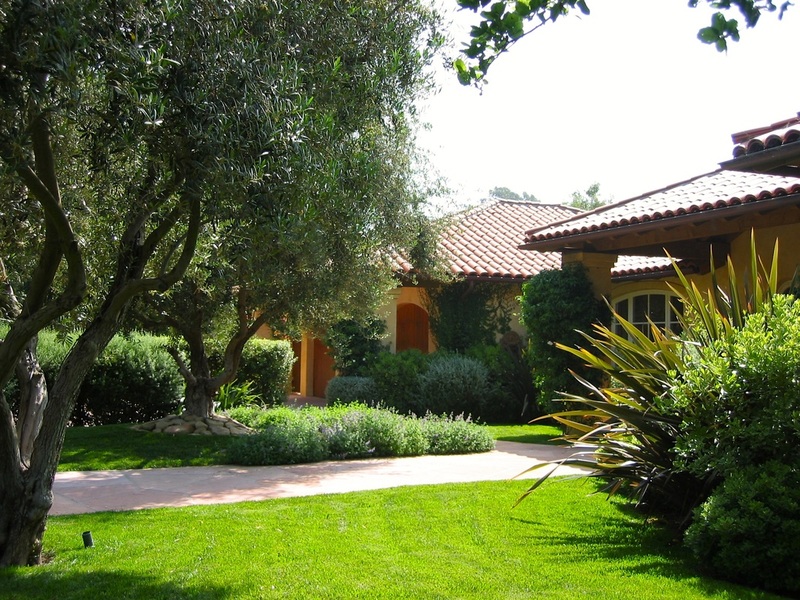 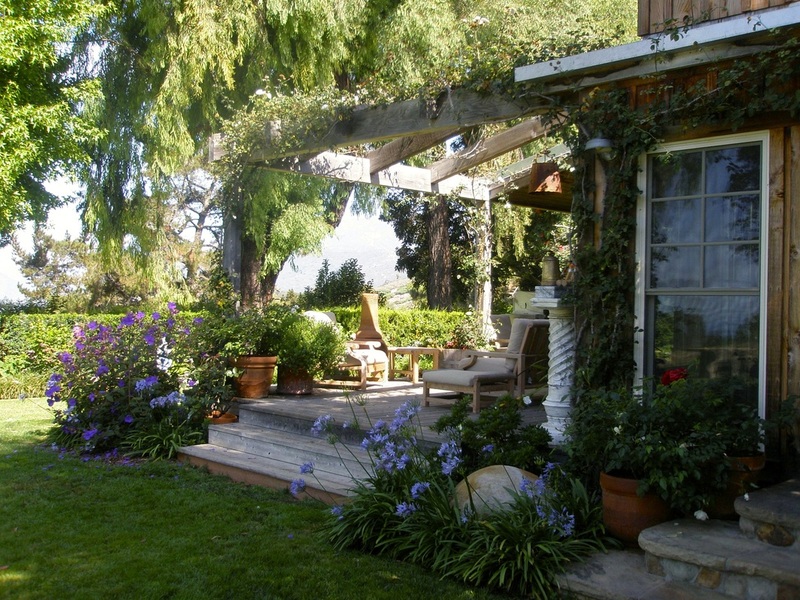 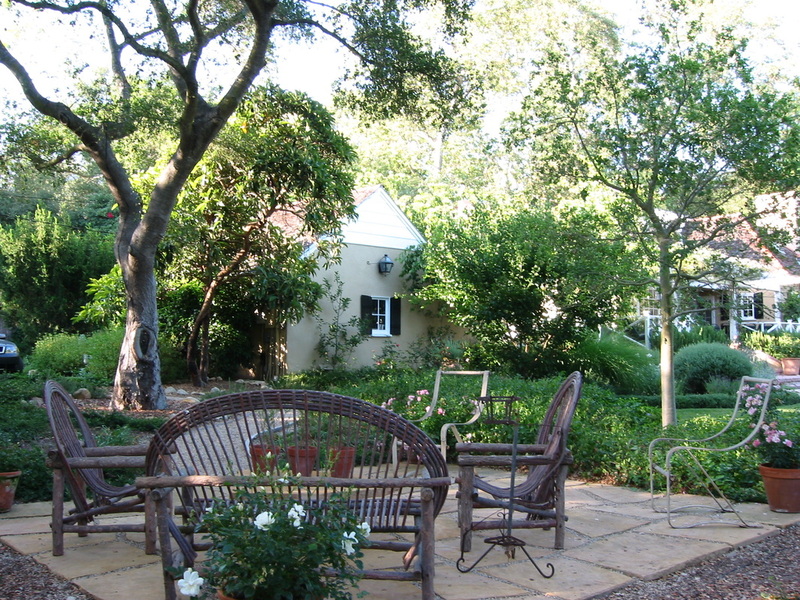 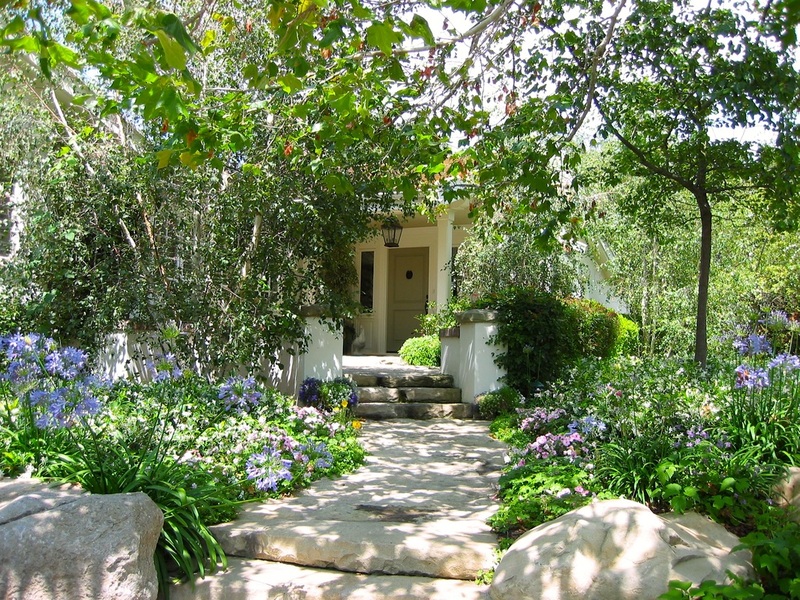 Off a hidden lane in Montecito, this Sycamore and Oak tree filled property has a traditional style home. 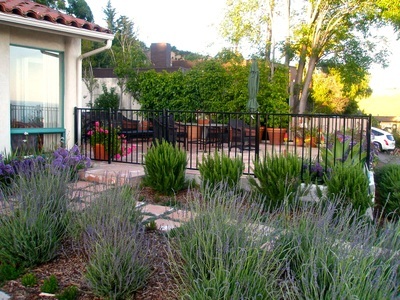 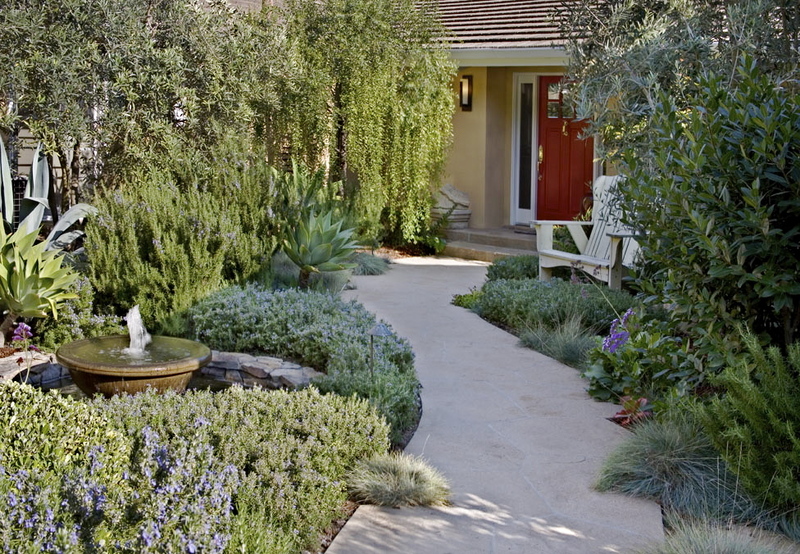 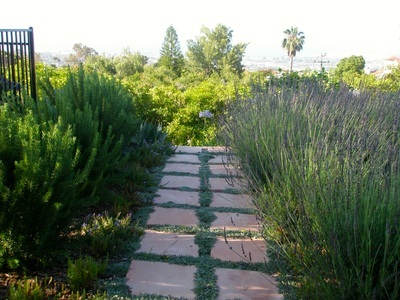 The Aldrich team designed a soft, tranquil garden to accentuate the mountain views in the front garden. 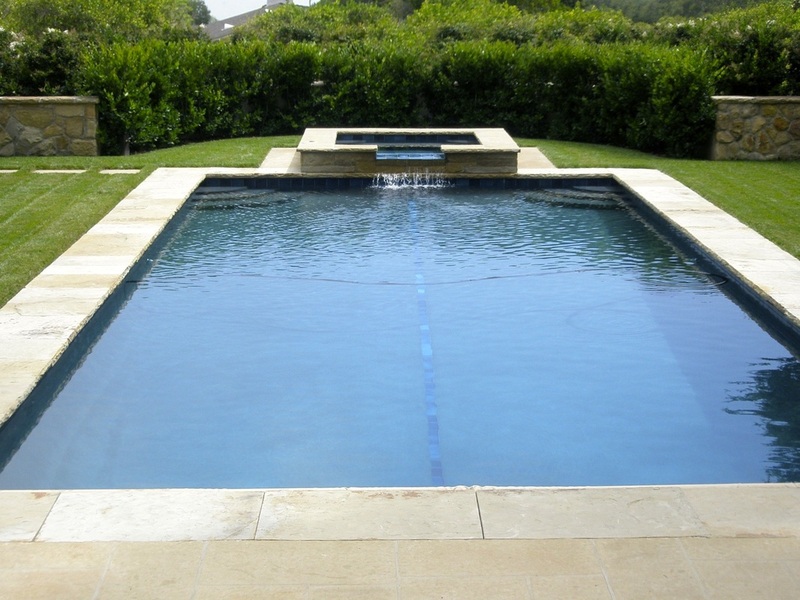 We also designed and installed a magnificent blue tiled pool in the rear garden, and added an outdoor room under the Oak tree. 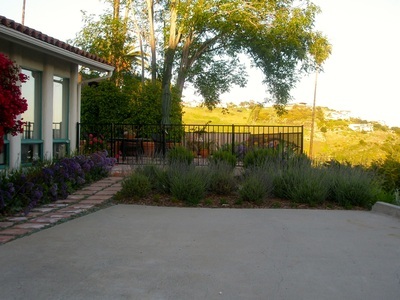 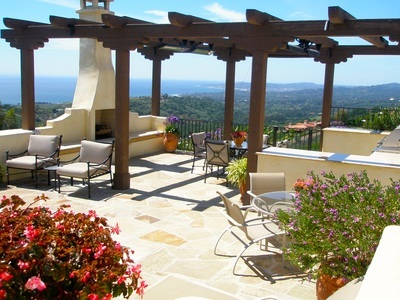 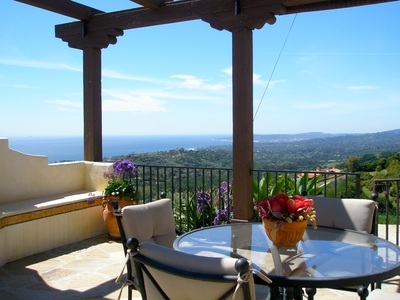 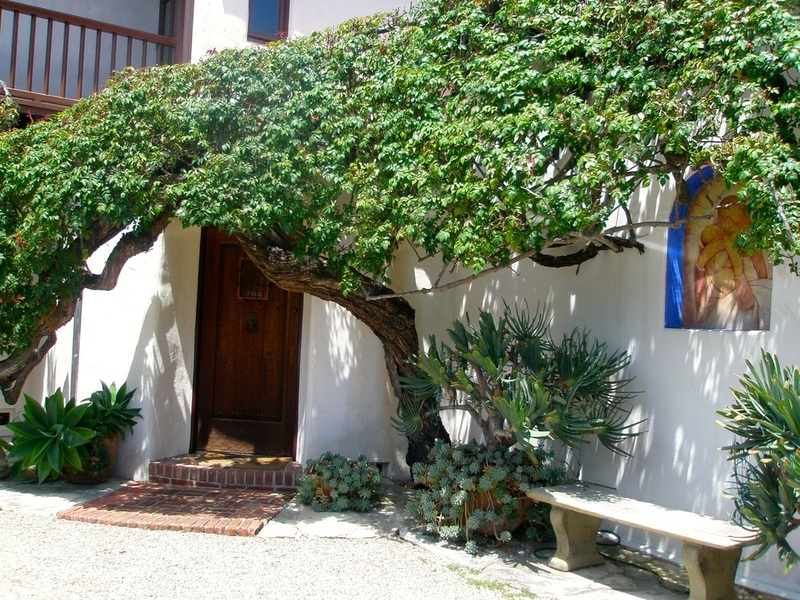 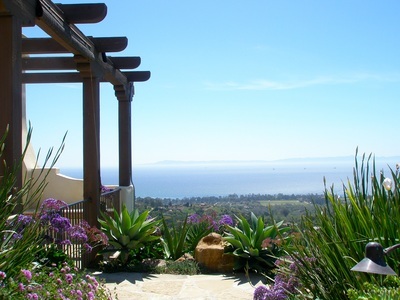 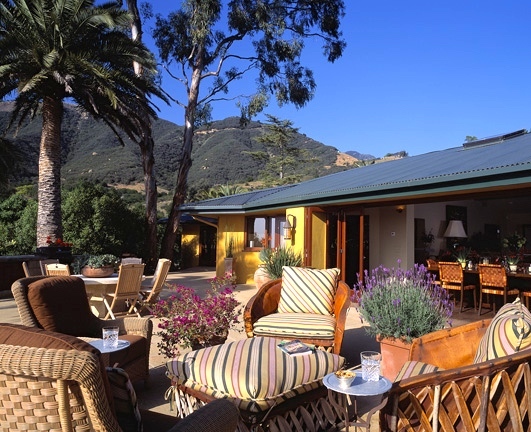 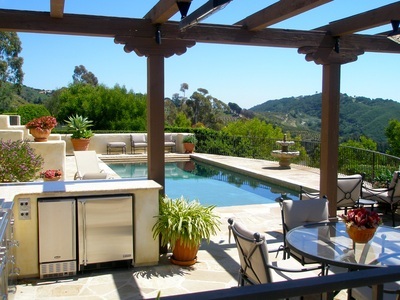 This property has spectacular coastal views of Santa Barbara, the Harbor and the Channel Islands. 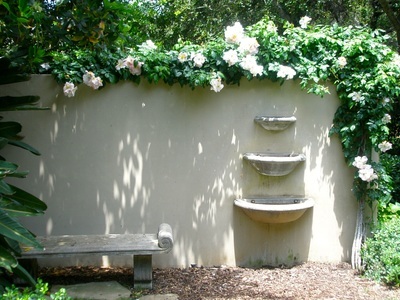 The only thing left after demolition was the pool, which was designed into the beautiful back wall with fountain spouts. Otherwise the whole house and gardens were re-designed. 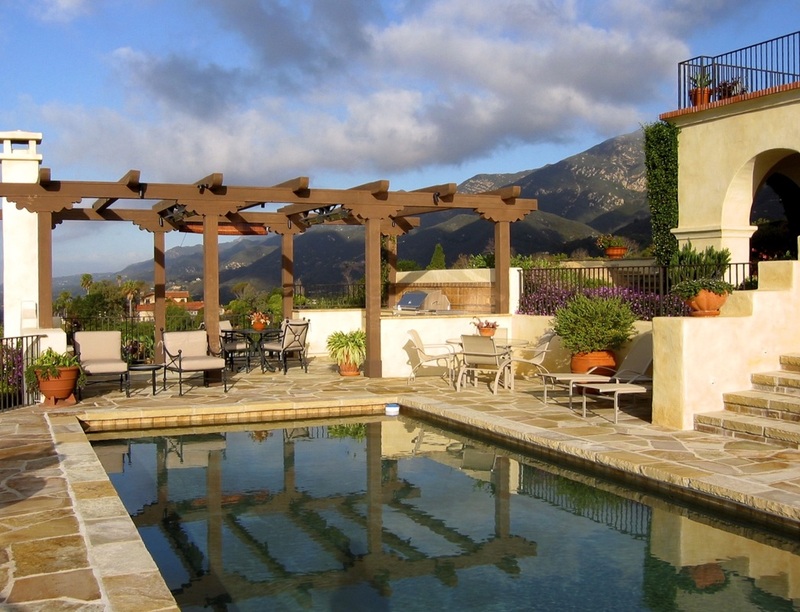 This property is terraced down a hillside and the client wanted a great deal of entertaining space, so the entire space was designed, from the front garden to the rear patio, with an indoor outdoor feel, capitalizing on the fabulous views of the property.